Picture it in your mind: thousands of multihued dabs of paint filling two-thirds of a four-foot canvas, fading into pale oblivion at its top. In the right corner, a bevelled window opening into bright light that flows through the window onto an artist’s palette furnished with an array of colors. Framed in the window opening is a single bell, linked to the palette by a taut cord. Could it be the palette of a deity, who mixes the colors of the world’s multiethnic masses represented by the colorful strokes of paint below? Is the bell a reminder of the belief that every time a bell rings, an angel gets its wings? Another canvas features hundreds of buildings, each atop its own towering cube, in a barren tan plain. The buildings seem to radiate out a single cleared area in a symmetrical forest. In the key-shaped clearing stands a teepee. The composition reminds us that before we bulldozed most of our nation, the Indians lived in harmony with nature. Paintings by Heriberto Mora, whose enigmatic oils are featured in our current exhibition, “Visiones Personales,” often suggest a spiritual or environmental message. Mora had three paintings featured in a 2004 Hollywood film, “Curdled.” He also has had his work featured as covers on four books. After graduating from the San Alejandro Academy of Fine Arts in Havana, Mora followed the path of many other emigrating Cubans, first moving to Spain and then to Florida. Since then he has exhibited in a number of galleries in Florida, New York, North Carolina, the Dominican Republic and Puerto Rico. 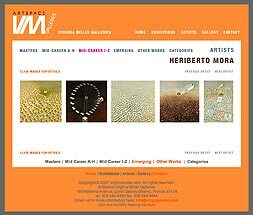 Mora’s provocative works are included in such collections as the Lowe Art Museum and Frost Art Museum, both in Miami, and the Fort Lauderdale Museum of Art, along with the Absolut Vodka Collection in New York as well as private collections in Madrid, Paris, New York, Bogota, Miami, Washington, Caracas, Buenos Aires, Monterrey, Mexico City and San Juan.